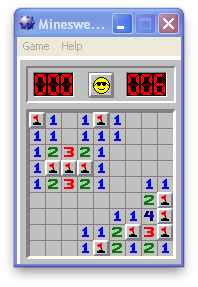 I happen to be a fan of the Microsoft Windows game called Minesweeper. 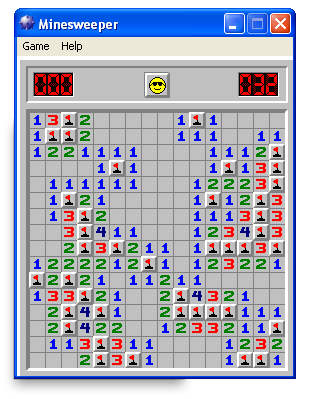 This is a simple but tedious game where you try to uncover all the hidden mines on a large grid without blowing yourself up. Here are my best games to date, and my high score screens. 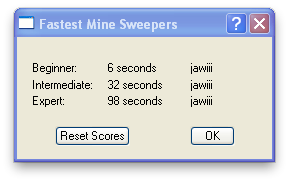 The top set of scores and screens with the blue title bars are from Windows XP running as a virtual machine on a Macintosh. The lower images with the green menu bars are older screen shots from a Windows 95 desktop machine. My current best at the expert level is 98 seconds, which I hit on 6/7/2013. That was the first time I had ever broken below 100 seconds after chasing that goal for many years. Previously, I had hit 100 seconds on 12/7/2012, 108 seconds on on 3/12/2003, and 112 seconds on 9/9/2002. 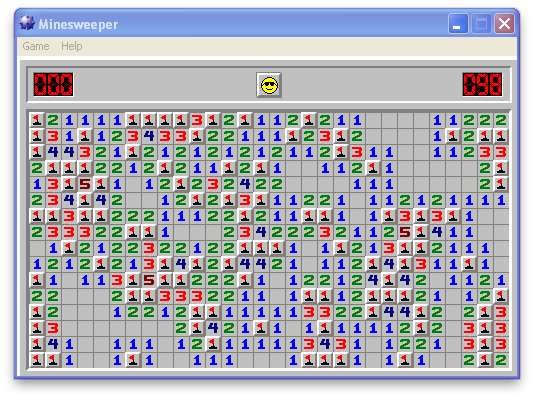 Sadly, Microsoft totally screwed up both the Solitare and Minesweeper games in Windows 7 making them clunky to play as well as ugly looking to the point of being unplayable. While you can copy the XP versions of these games to Windows 7, running Windows XP as a virtual machine is a slick solution that doesn't require any additional hardware or modifications to your Windows 7 software.